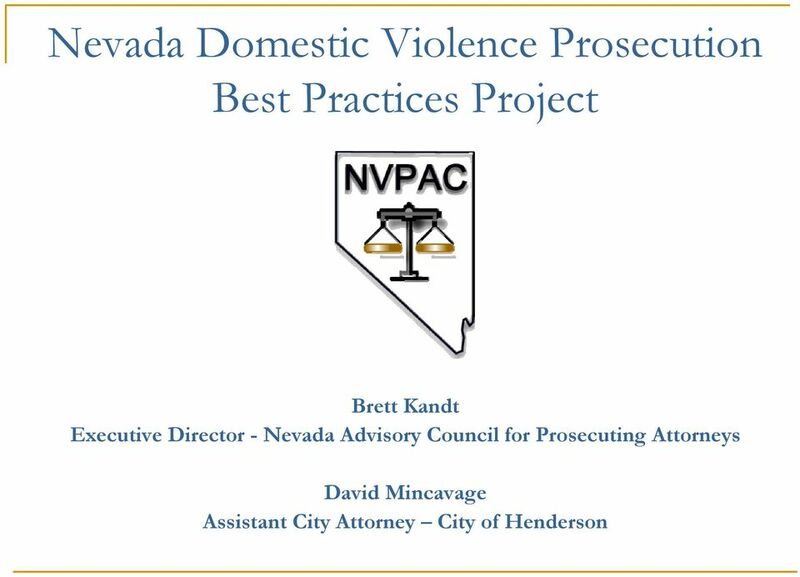 Download "Brett Kandt Executive Director - Nevada Advisory Council for Prosecuting Attorneys David Mincavage Assistant City Attorney City of Henderson"
2 The Role of the Prosecutor Henceforth there shall be in every County a sober, discreet and religious person appointed by the county court to be Atturney for the Queene to prosecute and implead in the lawe all criminall offenders and doe all things necessary or convenient as an atturney to suppress vice and immoralitie. 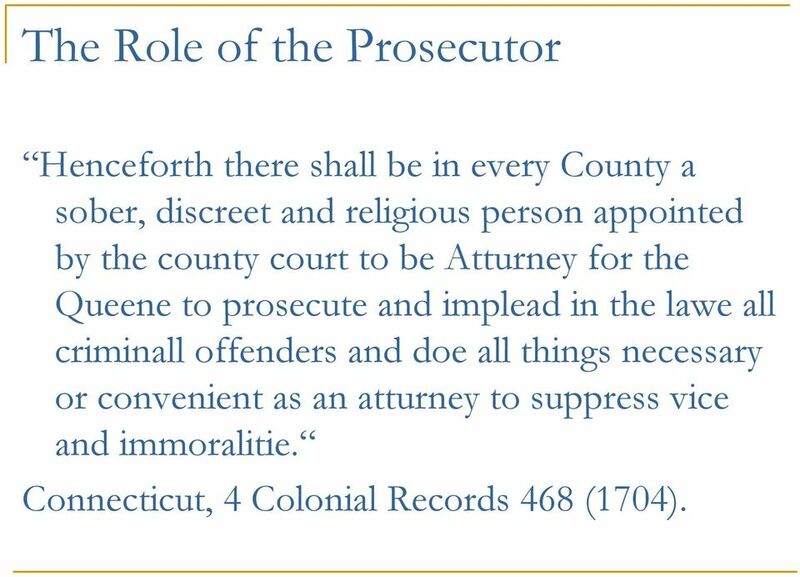 Connecticut, 4 Colonial Records 468 (1704). 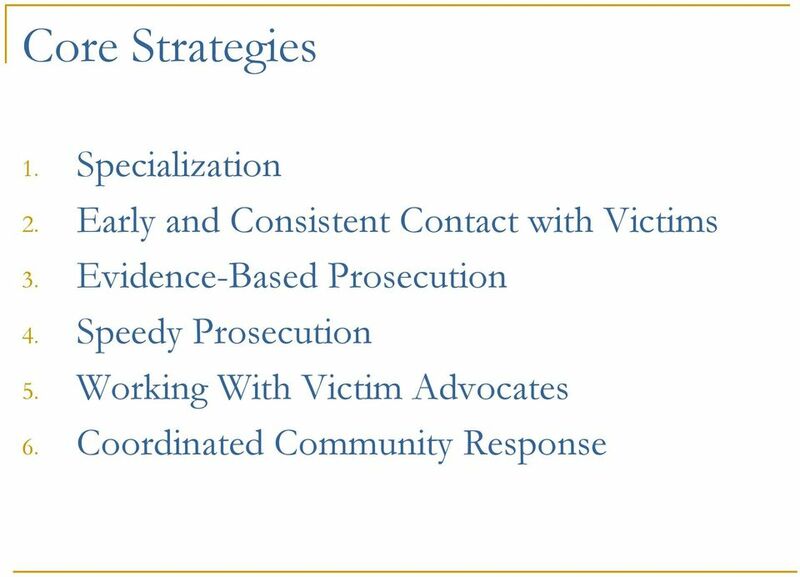 4 Project Goals Although prosecution is just one component of a coordinated community response to the crime of domestic violence, prosecutors are in a unique position to spearhead efforts to improve the criminal justice system s handling of domestic violence cases. 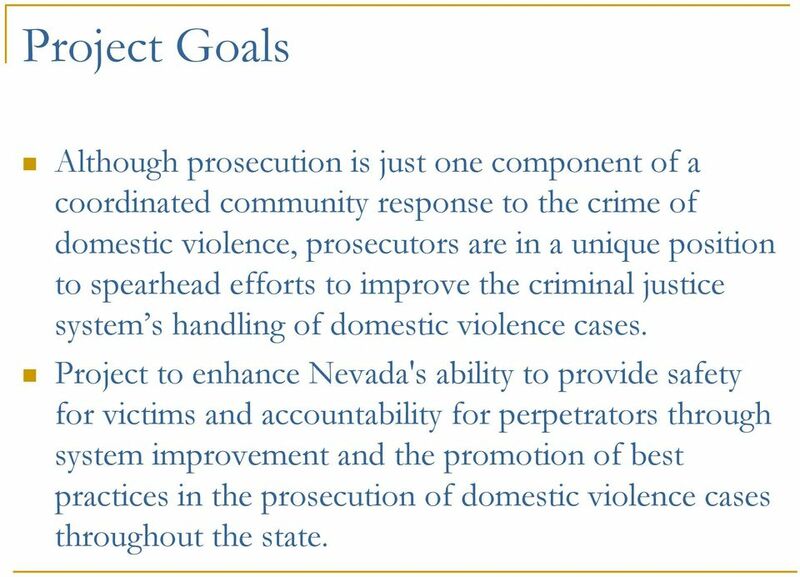 Project to enhance Nevada's ability to provide safety for victims and accountability for perpetrators through system improvement and the promotion of best practices in the prosecution of domestic violence cases throughout the state. 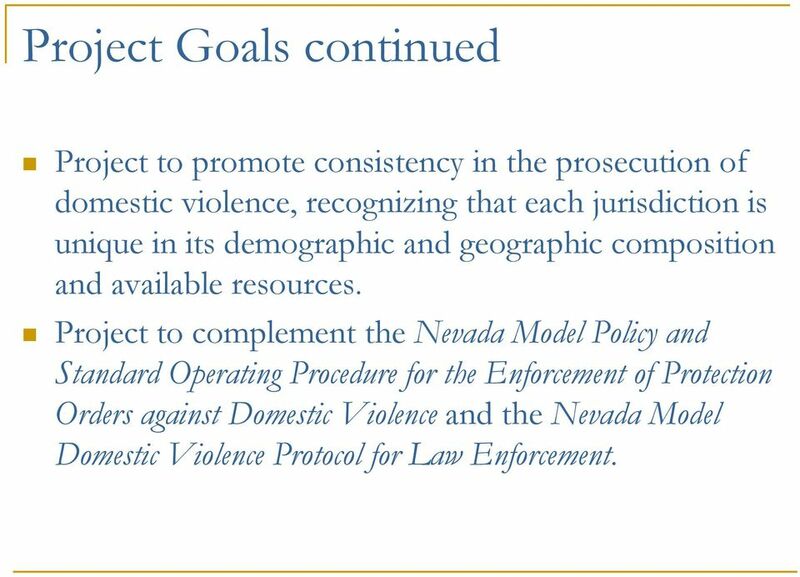 5 Project Goals continued Project to promote consistency in the prosecution of domestic violence, recognizing that each jurisdiction is unique in its demographic and geographic composition and available resources. 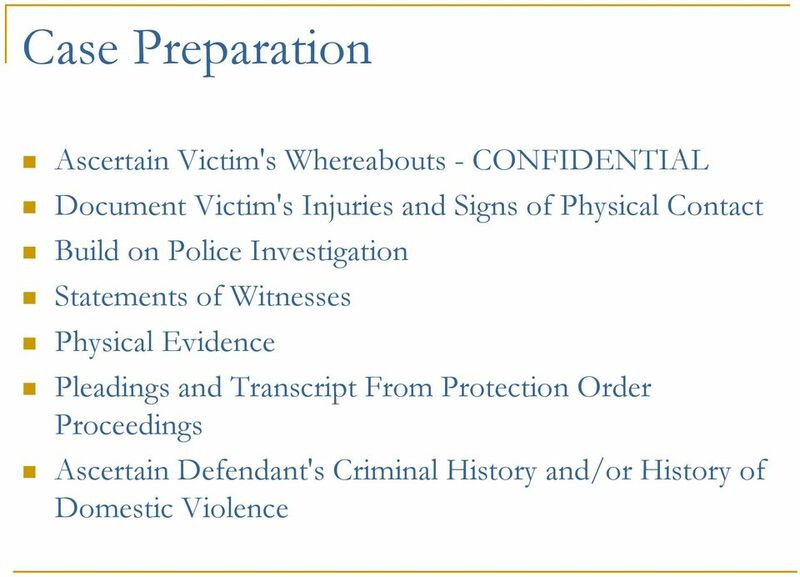 Project to complement the Nevada Model Policy and Standard Operating Procedure for the Enforcement of Protection Orders against Domestic Violence and the Nevada Model Domestic Violence Protocol for Law Enforcement. 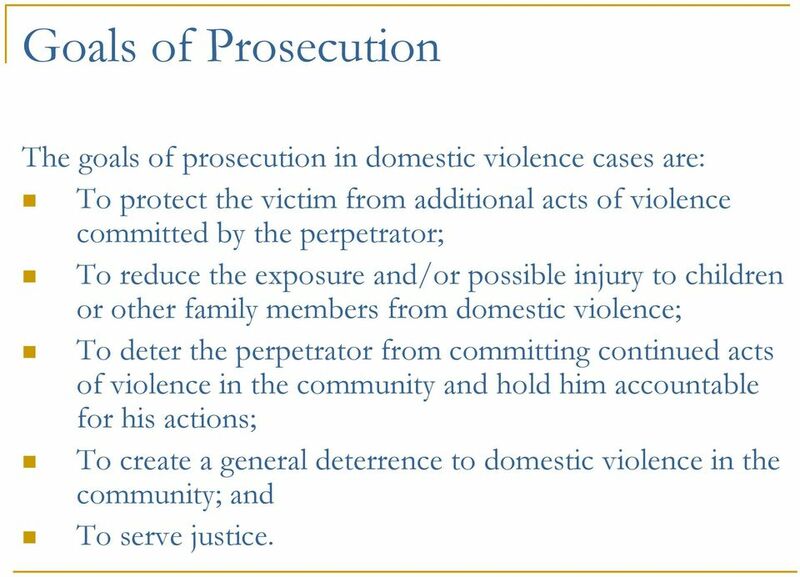 8 Goals of Prosecution The goals of prosecution in domestic violence cases are: To protect the victim from additional acts of violence committed by the perpetrator; To reduce the exposure and/or possible injury to children or other family members from domestic violence; To deter the perpetrator from committing continued acts of violence in the community and hold him accountable for his actions; To create a general deterrence to domestic violence in the community; and To serve justice. 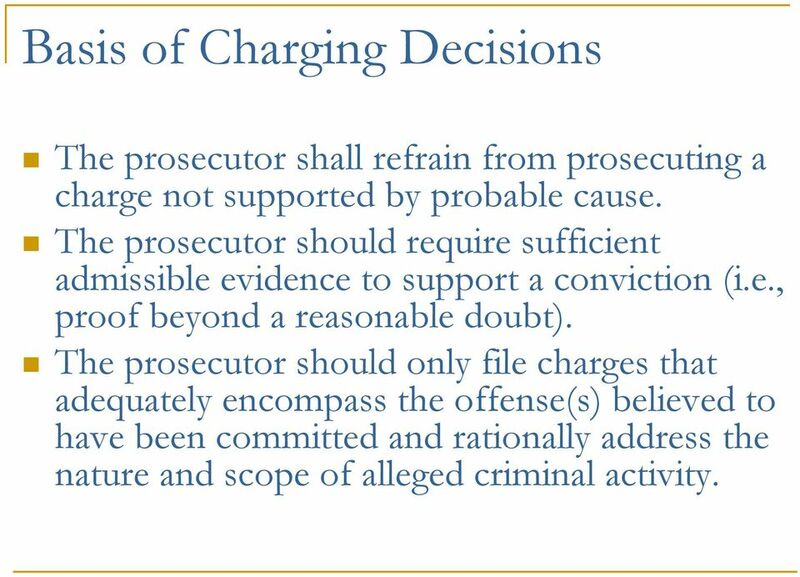 11 Basis of Charging Decisions The prosecutor shall refrain from prosecuting a charge not supported by probable cause. 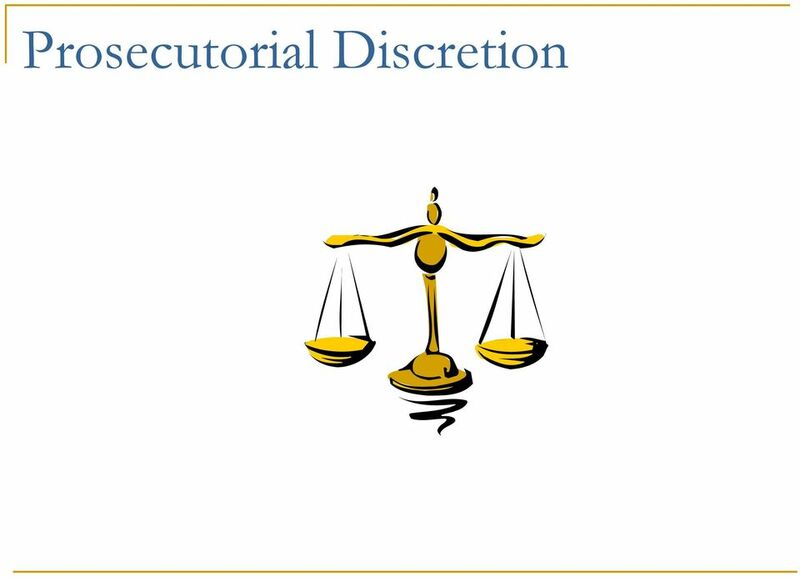 The prosecutor should require sufficient admissible evidence to support a conviction (i.e., proof beyond a reasonable doubt). 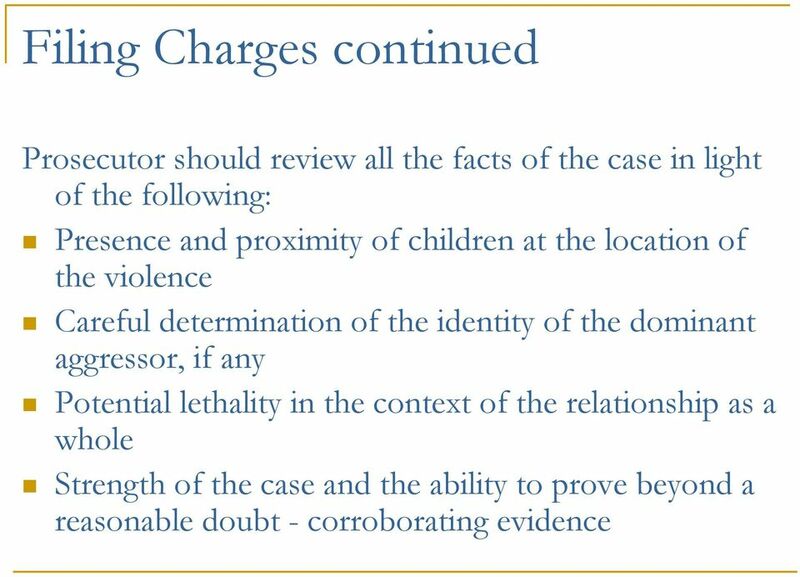 The prosecutor should only file charges that adequately encompass the offense(s) believed to have been committed and rationally address the nature and scope of alleged criminal activity. 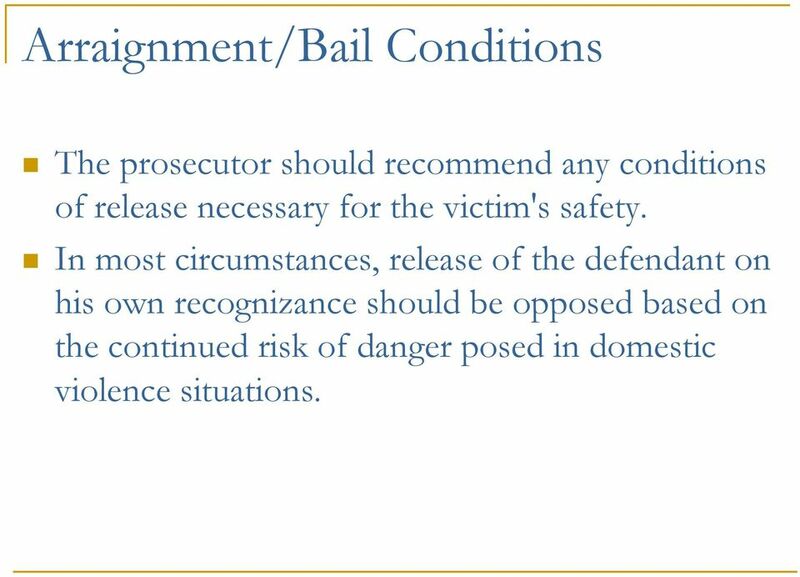 15 Arraignment/Bail Conditions The prosecutor should recommend any conditions of release necessary for the victim's safety. 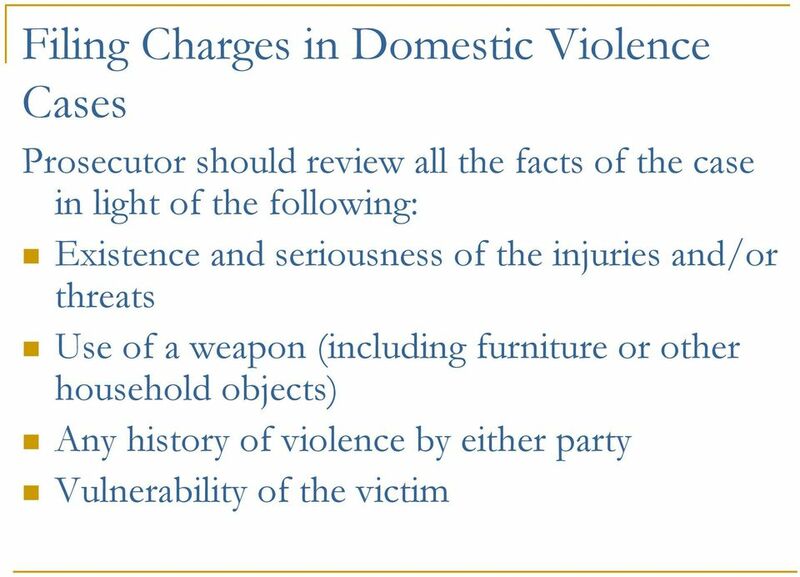 In most circumstances, release of the defendant on his own recognizance should be opposed based on the continued risk of danger posed in domestic violence situations. 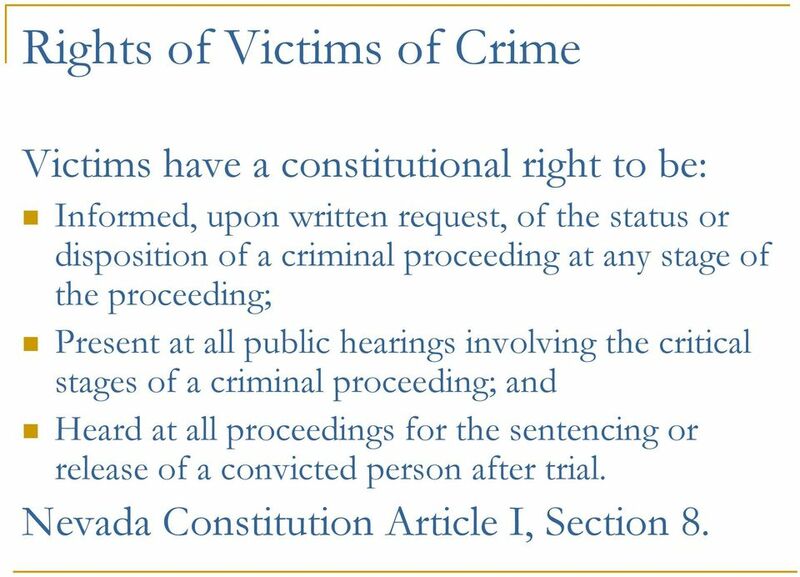 18 Rights of Victims of Crime Victims have a constitutional right to be: Informed, upon written request, of the status or disposition of a criminal proceeding at any stage of the proceeding; Present at all public hearings involving the critical stages of a criminal proceeding; and Heard at all proceedings for the sentencing or release of a convicted person after trial. Nevada Constitution Article I, Section 8. 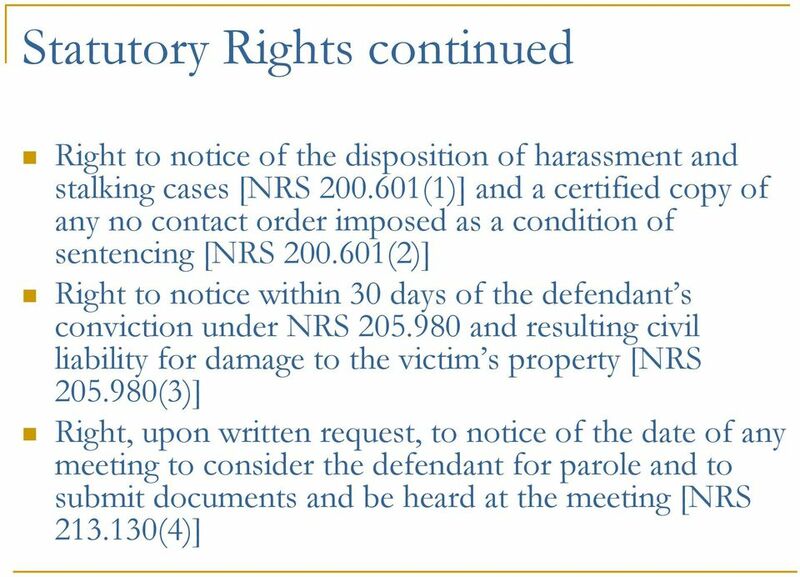 21 Recommended Notification The prosecutor's office should be responsible for notifying the victim, when possible, in a timely fashion of developments in the case, including, but not limited to, the following: Nature and type of charges filed; Any changes in the defendant s custodial status, including any short term release; Date, in advance, of any court hearing in which the victim may have an interest, including bail hearings and sentencing; and Outcome of all court appearances at which the victim was not present, including continuances, bail hearings, and motions. 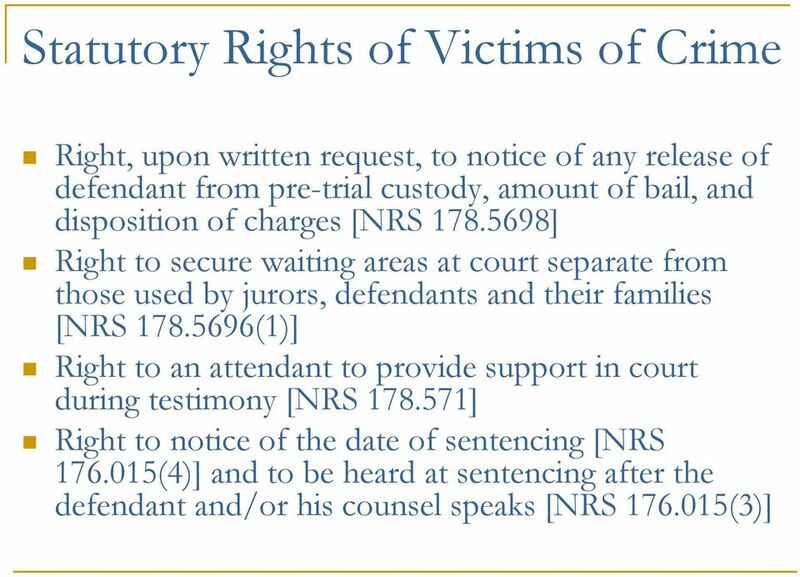 24 Negotiated Pleas NRS (7) prohibits plea bargains unless it is determined that the charge cannot be proved at the time of trial. 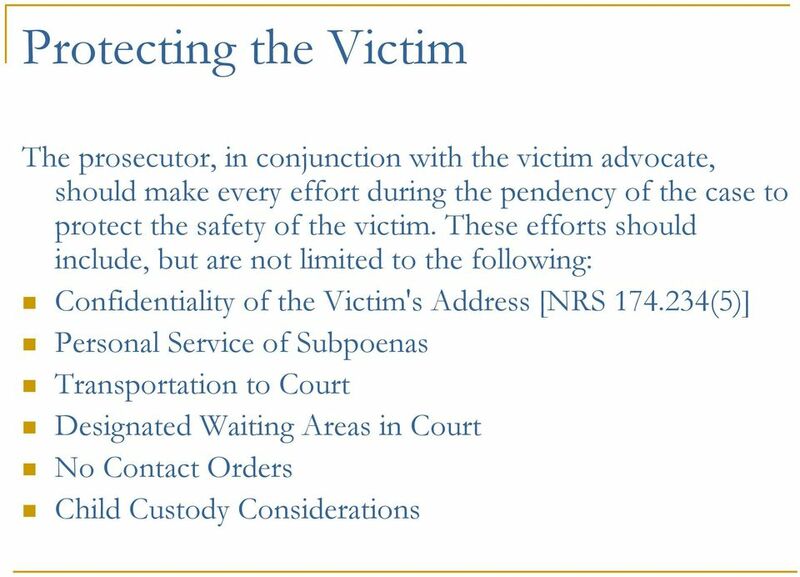 Before negotiating any plea, the prosecutor should consider the following factors: Realistic assessment of the possibility of successful prosecution without a plea; Seriousness of the offense; Prior criminal history of the defendant; Victim s input; Any history of violence in the relationship and the probability of recurrence; and Any other relevant circumstances. 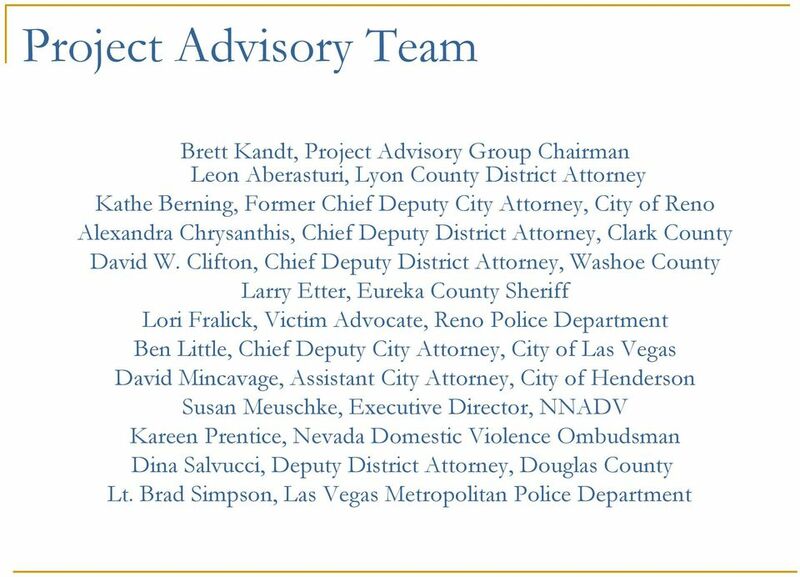 27 A Coordinated Community Response Jurisdictions form multidisciplinary implementation teams and use free technical assistance to identify and achieve local goals by building one or more Best Practices into the current infrastructure, given existing limitations in each jurisdiction. Use Safety and Accountability Audit process not as an evaluation tool to identify shortcomings in the current practices of a jurisdiction, but rather as an implementation tool for system improvement. 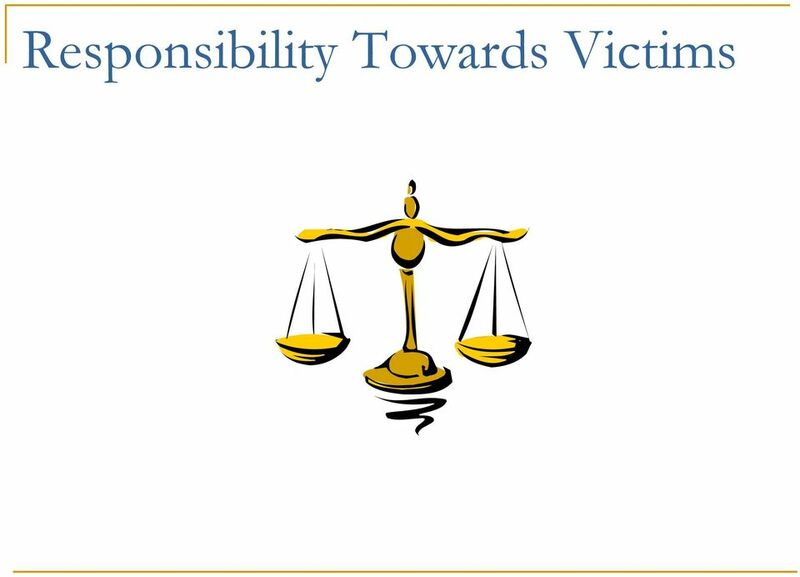 29 Disclaimer This Project was funded by Grant No WE- AX-0023, awarded by the Violence Against Women Grants Office, Office of Justice Programs, U.S. Department of Justice. 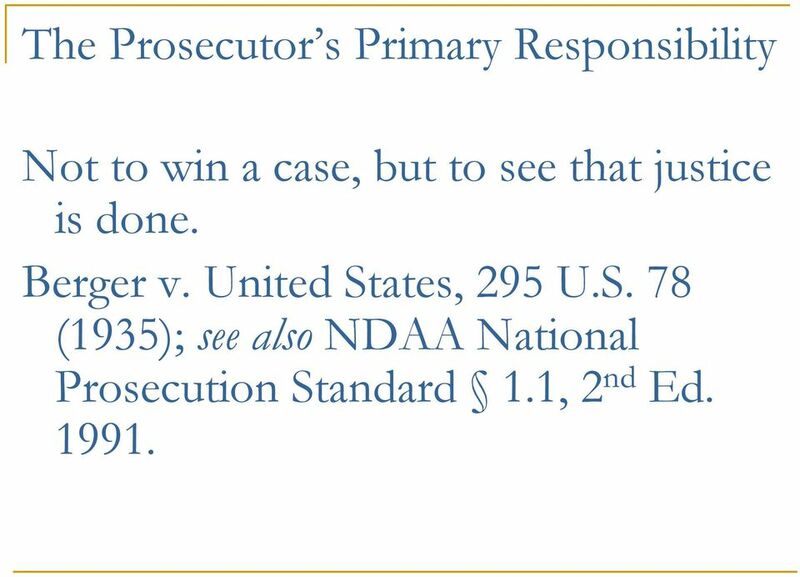 Points of view in this document are those of the authors and do not necessarily represent the official position or policies of the U.S. Department of Justice.